Terry found the app Art Rage on her IPAD app program, downloaded and started doing some gesture drawings. Pretty soon the designs looked better and better. She started sharing on FB with rave reviews and getting inquirys on where to purchase. She then figured out how to manipulate the image in photo shop to make it large enough to put on Fine Art America and is now sell prints on canvas, paper, metal, acrylic, pillows, duvee covers, shower curtains and more. She calls them Finger Paintings. Below is a link to Fine Art America to look at the designs. Last count over 200 different images available. Keep checking for new designs. Click on the Fine Art America logo below. This will take you to my Fine Art America account where you can purchase my images on canvas, paper, metal, acrylic, pillows, duvee covers, shower curtains and more.. 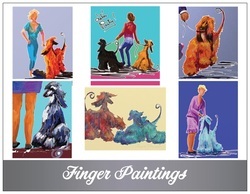 Many designs to choose from including Ipad Finger Paintings, oil paintings, pet portraits and plein air. Be sure to sign up below to receive updates on my website, blog, events, exhibits and new work. Enjoy. Any questions, please contact Terry at: Shacone@aol.com. If you would like to receive updates on my website, events, and exhibits, or have any questions, please sign up here. Thank you for coming to my website, I hope you will come back soon! All the paintings and photos are copyrighted by the Artist. Please do not copy without the artist consent. To sign up for updates on my artwork, events and exhibits, please go to the IPad Paintings page. All orders will be shipped by the Artist Terry d. Chacon. Contact her to place your order (unless a shopping cart is provided for Paypal customers), at shacone@aol.com or phone at (909) 798-0567 during studio hours of 10 am to 4 pm PST Monday through Friday. Shipping and handling will be added at time of order. We accept Paypal, major credit cards and checks from us citizens. Out of the country, please contact me through email to place your orders. Will need your full address to give shipping quotes.